The Pistons played to a split over the weekend, first losing to Memphis in overtime and then beating Boston last night in a game that was probably closer than the final score indicates. I was stuck in New York for the weekend and was unable to catch the Memphis game, but I was able to see the Celtics win and have some assorted thoughts from both games. The above-pictured game-winning three pointer notwithstanding, the Pistons' frontcourt spacing issues are very real. For proof, look no further than Josh Smith's game log in which he took an astounding 32 three pointers in seven preseason games. Though he connected on a fair amount of those he took from outside (40.6%), we have too much data on Smith to believe this is anything other than a statistical anomaly. 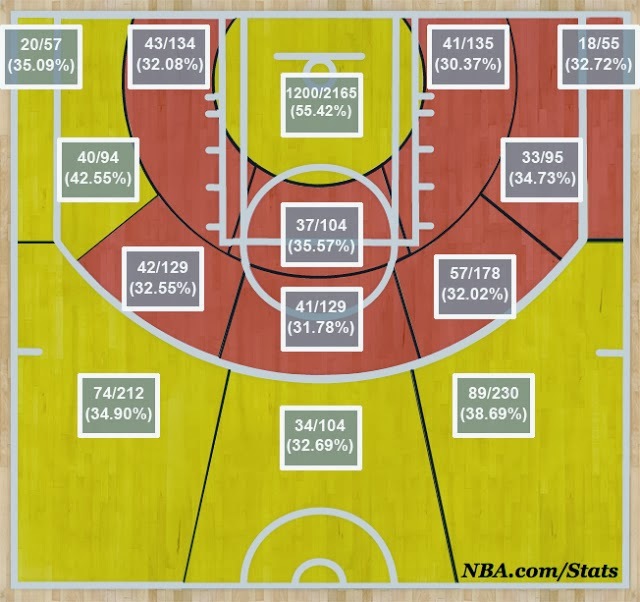 The most pressing matter for the Pistons in the near term is finding a way to get Smith away from the perimeter and into the paint where he's most effective. I don't know if that means trying to give him the ball in pick and roll situations (though this seems difficult given his horrendous 18.6 turnover rate, the highest of his career by a significant margin) or starting games with Greg Monroe or Andre Drummond on the bench, but it's clear that something needs to change. Please don't "Darko" Kentavious. With the return of Brandon Jennings last night, KCP spent the entire game glued to the bench in favor of Rodney Stuckey. Though he was never going to be the player Joe Dumars expected, Darko's development was deeply hindered by Larry Brown's utter refusal to play him, instead favoring veterans not unlike Cheeks is doing now. The last thing that the Pistons need is to stunt the development and confidence of the program's SG of the future who is in need of both. KCP has struggled to find his rhythm on the offensive end but has shown flashes of the upside that the Pistons expected when they drafted him. Giving him zero minutes against an Eastern Conference bottom feeder like Boston is the surest way to limit any potential development early in the season. The other problem that arises concerns Cheeks' apparent lack of concern about the offensive spacing. With Rodney Stuckey on the floor, the Pistons are typically deploying Monroe/Drummond and Smith, Stuckey, and some random grouping of role players. With the front court devoid of outside shooting, Stuckey's inclusion in the lineup (a career 28% three-point shooter) further confounds the issue. Other than being a veteran, Stuckey offers almost nothing that KCP doesn't. Continuing this rotation will lose the Pistons several games. What we expected to happen. What is basically happening. Monroe/Drummond/Smith update. Sunday's game against Boston featured some of the best big-man passing I've ever seen. The no-look dishes and quick decisions to find a cutting Andre Drummond were masterful. However, 21 turnovers is no fluke, especially when 11 of them come from your frontcourt, which is being asked to make passes that frontcourts do not make. When it's working, the Pistons' oversized front three are nearly unstoppable, but finding consistent production from them while avoiding turnovers appears impossible. In the regular season, the frontcourt trio has accounted for 21 of the Pistons' 58 team turnovers (36%). Though you can expect frontcourt turnover numbers to be inherently inflated, the team's awful turnover percentage--second only to Boston for most turnovers per game with 20--points to a schematically flawed system. 10 minutes of bad basketball. When I was in undergrad at the University of Michigan, I had season hockey tickets. Without fail, the team would look awful for an entire period, allowing the opponent either to take the lead, tie it up, or at least wear down the team and generally cause mental and emotional frustration. 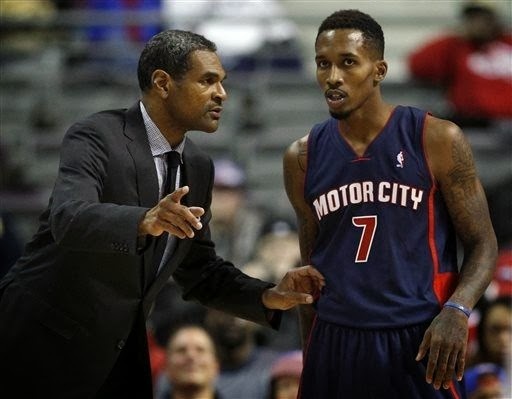 Last year's Pistons adopted a similar trend, which has carried through to this season. Against Boston, the Pistons scored only 5 points in the final five minutes of the third quarter and first two minutes of the fourth. Without a consistent go-to scorer, Cheeks will need to find ways to generate offense when they are slumping, something Lawrence Frank was unable to do. Greg Monroe has never encountered a shot he didn't want to miss. Monroe's biggest problem is his lack of efficiency. Following a great season opener where he got to the line frequently, Monroe has returned to form, missing semi-contested layups and struggling to finish around the rim. For the season, he is shooting only 48.7%, almost the exact same as last season's career low. And while he made it to the free throw line 15 times against the Wizards, he's only reached the charity stripe 8 combined times in the following two games. Brandon Jennings is going to fun. He may not always be great, but if his first appearance in a Pistons jersey didn't convince you of his entertainment value, we aren't going to agree on much.